Constantine - the Early Years. On the 27th of February 272 AD, Flavius Valerius Aurelius Constantinus was born in the Moesian military city of Naissus (Ni in Serbia). Constantine's father, Flavius Constantius, an Illyrian from what would later become Dacia Ripensis, was an officer in the Roman army at the time of his sons birth, serving as an imperial bodyguard to Emperor Aurelian in Syria. The position proved favourable to Constantius' career: in 284/5 AD, the newly incumbent Emperor Diocletian, another Illyrian who had also served under Aurelian, appointed Constantius governor of Dalmatia. Constantine's mother, Helena, was a woman of humble origin: one source claims her to be a mere concubine of Constantius, another calls her "extremely lowly", and yet another that she had been a mere stable maid when she met Constantius. More reliable sources generally agree that she was Constantius' legitimate spouse, and that Constantine was thus a legitimate heir. The Tetrarchy. As emperor, Diocletian effected a systematic and comprehensive division of the Empire. Two emperors would rule the Empire, one in the East and one in the West, in a system called the Tetrarchy. Diocletian would rule the East from Nicomedia (Izmit), and an old Illyrian colleague, Marcus Aurelius Valerius Maximianus Herculius (Maximian; lived c. 250 - July 310 AD), would rule the West from Mediolanum (Milan). Each emperor would have his own court, his own military and administrative faculties, and each would rule with a separate praetorian prefect as chief lieutenant. In 288 AD, Maximian appointed Constantius to serve as his praetorian prefect in Gaul. Constantius divorced Helena, and married Maximian's stepdaughter Flavia Maximiana Theodora ca. 28889 AD. Diocletian, dissatisfied with his first division, divided the Empire again in 293 AD, appointing two Caesars - junior emperors - to rule over further subdivisions of East and West. Each Caesar would be subordinate to their respective Augustus - senior co-Emperors Maximian and Diocletian - but each would act with supreme authority in their own assigned territories. Thus it was that on the 1st of March 293 AD, Constantius was promoted to the office, and given the task of suppressing the usurper Carausius' rebellion in Britannia and Gaul. At the Court of Diocletian. Constantine, now a Caesar's son, became a potential candidate for future appointment to the Tetrarchy. In the politics of the day, however, Constantine was obliged to spend his youth at Nicomedia as a hostage in the court of Diocletian; the Augustus did not completely trust Constantius - none of the tetrarchs fully trusted their colleagues - and would have wished to have collateral to ensure good behavior. Regardless, young Constantine benefited greatly receiving a formidable education, gaining a skillful understanding of Latin literature, a capable proficiency in Greek, and an aptitude for philosophy. Whether hostage or not, he was a prominent member of the court, participating fully in the political life of the Empire. Constantine fought for Diocletian and Gaius Galerius Valerius Maximianus (Galerius; lived c. 2505 May 311 AD) in Asia, serving in a variety of tribunates. He campaigned against barbarians on the Danube in 296 CE, fought in the Persian wars under Diocletian in Syria (297 AD) and Galerius in Mesopotamia (29899 AD). He travelled to Babylon in Mesopotamia and Memphis in Egypt. Returning from his Egyptian voyage, he met the young Eusebius, his later biographer, in Caesarea Maritima in Palestine. Constantine impressed him with his intelligence, strength, and natural grace. On 23rd February 303 AD, Constantine probably witnessed, firsthand, Diocletian's destruction of the newly-built Christian church at Nicomedia. The event inaugurated what Christian authors have named the "Great Persecution" as many of the brethren were imprisoned, tortured, and killed for acts of defiance against official religious policy (most escaped punishment through silence). Constantine's silence on the extent of his complicity while at Diocletian's court during this period engendered a continuing distrust among the church hierarchy for any participation on his part in church government. In a late letter to Eastern provincials, Constantine described himself as a child when the Great Persecution began, when in fact, he was nearer to thirty; his later biographers and panegyrists continued the trend, describing him as "the young man" or "the youthful emperor". Indeed, no contemporary Christian challenged him on any aspect of his role in the persecutions. Nonetheless, Constantine continued to assert that he had criticised the policy when first introduced. Constantine - the Pampered Prince. Enters the Arena. Diocletian had become increasingly sick over the winter of 304-5 AD, following the contraction of a minor illness in the spring on the Danube. He had disappeared into his palace after November 304 AD, and rumors of his imminent death circulated for months afterwards. When he at last appeared in public on 1st March 305 AD, he was emaciated and barely recognizable. His judgment and will power were seriously impaired, and he was left prey to the will of Galerius, who arrived in Nicomedia with plans to reconstitute the tetrarchy according to his will, and fill the imperial office with compliant candidates. Through coercion and threats, he convinced Diocletian and Maximian to comply with his plan. On 1st May 305 AD, Diocletian, addressed an assembly of generals and his traditional companion troops, and informed them of his will to resign. Constantius was to succeed Maximian as Augustus of the West, with Maximinus Daia and Severus II made eastern and western Caesars respectively. Although two legitimate sons of emperors were available (Constantine, as the son of Constantius, and Marcus Aurelius Valerius Maxentius (Maxentius; lived c. 278 - 28 October 312 AD), as the son of Maximian), both were ignored in the transition of power. This perceived slight served to create instability within the Tetrarchy, and inspire jealousy in Constantine and Maxentius. These feelings were intensified in the case of Constantine by the fact that familial ties had helped to elevate Maximinus Daia, as Galerius' nephew, but had not helped Constantine himself at all. Galerius, recognizing Constantine's discontent, sent him off to war presumably in the hope of him being killed. Against expectations, Constantine succeeded in leading his men to victory, and subsequently continued to rise in rank, reaching the level of tribune of the first order by late 305 AD. Constantine Flees to Britain. When the ailing Diocletian had retired after twenty years as Augustus, Constantine must have been dismayed that he had been passed over for the position of Caesar. Frustrated, and recognising the implicit danger in remaining at Galerius' court, Constantines continued survival depended on being rescued by his father in the West. Constantius, similarly aware of the dangerous circumstances faced by his son, was quick to intervene. In the late spring or early summer of 305 AD, Constantius requested leave for his son for help in combat operations against the Picts in Britannia. Constantius' request was granted by Galerius during a long evening of drinking and before it could be revoked in the morning, Constantine fled the court to join his father in Gaul, at Bononia (Boulogne). Father and son made their way to Eboracum (York) from where the pair spent a year fighting Pictish raiders beyond Hadrian's Wall in the summer and autumn. Constantius had become severely ill over the course of his tenure, and died in Eboracum on 25th July 306 AD. Before his death, however, Constantius had declared his support for raising Constantine to the rank of full Augustus. Led by the Alamannic king Chrocus, Constantine was proclaimed Augustus by troops loyal to Constantius' memory. Word spread of Constantine's acclamation, with the whole of Gaul quickly pledging him its allegiance. Legitimising the Claim. Constantine's succession was clearly contrary to Diocletian's original plans and his position was therefore somewhat insecure. Nonetheless, with Constantius' support and the backing of his armies, it mattered little. Constantine was now directly sub-ordinate to Galerius, so he sent the latter an official notice of Constantius' death and his own acclamation, including with the notice a traditional portrait of himself robed in the outfit of Augustus of the West wearing the imperial wreath. Constantine duly requested recognition as heir to his father's throne, while blaming his army for his unlawful ascension, claiming they had "forced it upon him". Galerius was displeased and it was with difficulty that his advisers convinced him of the necessity of peace and the inherent dangers in challenging a popular man. Galerius was compelled to compromise. He sent Constantine a purple vestment - impressing on Constantine that he, Galerius, remained the true source of power - and granted Constantine the title of Caesar (while elevating Flavius Valerius Severus (Severus; died 16 September 307 AD) instead to the office of Augustus). Constantine accepted the decision, as it served to remove any possible doubts regarding his legitimacy, and began appearing on imperial coinage as Flavius Valerius Constantius the Noble Caesar. In the meantime, however, the usurper Maxentius (son of Diocletian's original colleague Maximian) had been proclaimed Augustus in Rome by the Praetorian Guard. In an unsuccessful attempt to remove the usurper, the newly appointed Augustus, Severus, was killed thus opening the field to an ambitious prince whose sights were on the bigger prize. Conversion - My Enemy's Enemy is My Friend. In the 4th century AD, the well established eastern provinces were by far the richest and most populous of the Roman world. Some of its cities, Pergamon, Symrna, Antioch and so on, had existed for almost a millennium and had accumulated vast wealth from international trade and as venerated cult centres. Through the provinces numerous cities passed Roman gold going East in exchange for imports from Persia, India and Arabia. Flowing west with those exotic imports came equally exotic 'mystery religions' to titillate and enthral Roman appetites. In contrast, the western provinces, now ruled by Constantine, were more recently colonised and less developed. Its cities were small new towns, its hinterland still uncivilised to Roman eyes. During the crisis decades of the 3rd century AD, many provincial Romans in the West had been carried off into slavery by Germanic raiders and their cities burned. The province of Britannia and part of northern Gaul had actually seceded from the Empire in the late 3rd century and had been ruled by its own Emperors (Carausius and Allectus), with the help of Frankish mercenaries (286-297 AD). Constantine may have ruled the West, but he certainly did not have a power-base in the East from which to mount a bid for the throne. He did have a plan, however. Constantine had been at Nicomedia in 303 AD when Diocletian had decided to purge the Roman state of a disloyal Christian element. Constantine had also served under Galerius on the Danube and had witnessed first-hand how the favoured Galerius, designated heir and rival, in particular despised the fledgling cult of Christianity. The ambitious and ruthless prince, from a base in Trier, immediately proclaimed himself protector of the Christians. Yet it was not the handful of worshippers in the West that Constantine had in mind - there had not, after all, been any persecution in the West - but the far more numerous congregation in the East. While they constituted a tiny minority within the total population (perhaps as few as 2%), the eastern Christians were an organised force, holding important positions within the state administration in many cities. Some even held posts within the imperial entourage. By championing the cause of the Christians, Constantine had neatly engineered for himself the leadership of a 'fifth column' in the Eastern Empire - effectively a state within a state. The Fabulous Sign. At first, Constantine honoured the Tetrarchy that had stabilised the Empire for a generation but when Galerius died in 311 AD, Constantine saw his opportunity. In the spring of 312 AD, in the first of his civil wars, Constantine moved against the ill-fated Maxentius to seize control of Italy and Africa - in the process almost annihilating a Roman army near Turin, and another outside of Rome. It is at this point that one of the more enduring myths of Constantines divine destiny makes its appearance - the writing above the sun appearing before Constantines victory over Maxentius army at Milvan Bridge. The legend has it that the words: In this sign, you shall conquer and the sign of the cross were visible to Constantine and his entire army. Perhaps the words were the Latin In Hoc Signo Victor Seris - a most bizarre cloud formation unique in the annals of meteorological observation! More likely the words would have been in Greek ('En Touto Nika'), but this would have left them unintelligible to the bulk of the army. Digging below the legend however, one can discover that the vision was in fact a dream reported some years later by Constantine to his secretary Lactantius. The story was later embellished by Bishop Eusebius in his Life of Constantine, and the sign of the cross must have been an even later interpolation as the cross was not a Christian symbol at the time of the battle at Milvan Bridge - nor would be until late into the 5th century AD. Any good luck emblem at this date would have been the rather ambiguous chi-rho: the first two letters of the word christos (in Greek meaning the anointed one), and also Chronos, god of time and interestingly a popular embodiment of Mithras! What is perhaps most significant about the story is that, while Constantine had not converted to Christianity, invoking its symbols was sufficient to apparently win divine patronage. But did Constantine really use Christian symbols as his biographers contest? Contemporary coins issued to celebrate the victory showed only Sol Invictus. Moreover, Constantines triumphant arch, still standing, refers only to the gods. In truth, Constantine was not a particularly pious man. Famously, he delayed his baptism until he was close to death for fear of further sinning, perhaps with good reason: among his many murders was that of his first wife Fausta (boiled alive) and eldest son Crispus (strangled). End of the Praetorians: New Germanic Cavalry. One consequence of Constantine's victories in 312 AD was the disbandment of the Praetorian Guard. The Praetorians had the misfortune to have backed Maxentius and those who had not fallen in the battle (many had drowned near the Milvan Bridge) were demoted and posted to garrisons on distant frontiers. Replacing the Praetorians was a special imperial guard, the Scholae Palatinae, an elite cavalry regiment of 500 men, mainly Germans. The creation of elite units was not new: Diocletian had pioneered a new force of imperial guards (Ioviani and Herculiani), but these had been crack infantry regiments. While Constantine's fondness for Germanic troops may be construed as a barbarisation of the army, the removal of the Praetorians had a far more costly long-term consequence - it effectively left Rome defenceless when the Visigoths arrived a century later. Multiple Civil Wars. Having added Italy and Africa to his realm, Constantine first secured his position with the senior Augustus in the East (Flavius Galerius Valerius Licinianus Licinius had succeeded to the throne of Galerius) by a 'peace pact' and the gift of his sister as a bride. Yet within a year, Constantine reneged on his agreement with Licinius and plunged the Empire into a new civil war. Two battles in the Balkans, Cibalae (October 314 AD) and Castra Jarba (November 314 AD), were stalemated with massive casualties on both sides. In a display of astute psychological warfare, it seems Constantine had unnerved the Christians in Licinius' army by displaying Christian emblems in his own legions. Licinius, an accommodating and benign Emperor, sued for a peace in which he acknowledged Constantine as the senior Augustus. Now titular monarch of the world, for the next decade Constantine concentrated on wooing the senatorial class in Rome, a process marked by a programme of public works in a city already in decline. The Fate of Rome. In the embattled years of the late 3rd century, the fortunes of the city of Rome began a downspin, at about the same time as Christianitys star was rising. By Constantines day there were about two dozen Christian meeting houses in the city but the imperial court and its bureaucracy had moved north, first to Milan and Trier, and later, to Ravenna and Arles. Affected both by civil conflict and the recurring epidemics arriving in its wake, the citys population began to fall. Worse yet, at the very moment that the Christian succeeded in converting the pagan city (albeit by happily assimilating pagan beliefs and ritual) through the consecration of the Lateran Basilica, Constantine was already well ahead with plans for a new capital, eight hundred miles to the East - the future Constantinople. After 326 AD, Constantine never again stepped foot in Rome leaving it instead to the Bishops, who picked up the mantle of falling grandeur and set the city on a new path to power as the centre of Christian catholicism. Autocracy. Having built support within the old imperial capital, but with his ambitions still not satisfied, Constantine provoked yet another civil war with Licinius in 324 AD. Constantine gathered an army of 125,000 infantry and 10,000 cavalry, and a fleet of 200 vessels. To meet the threat, Licinius stripped troops from the vulnerable Persian frontier to assemble a force of 150,000 infantry, 15,000 cavalry and a fleet of no fewer than 350 ships. Battle was joined at Adrianople on 3 July and Byzantium was blockaded. The fleets met in the Bosphorus, but Licinius's navy was overwhelmed by a storm, drowning 5,000 men in the process. Licinius surrendered on the promise of personal safety; six months later, he was strangled by order of Constantine. The tough and ruthless pampered prince had at last reached the summit of his ambition to be sole ruler of the Empire. Yet in his climb to mastery of the Roman world, 'the first Christian Emperor' had wrought the destruction of the Roman military machine. The huge loss of manpower could be made good only through the expedient of ever greater recruitment of barbarian detachments, hired as mercenaries to fight Rome's wars. Fatal Reorganisation of the Army. At the height of its power, Rome's vast empire had been successfully defended by legions stationed in fortresses on the frontiers. Its military machine had thoroughly mastered the arts of military support and logistics. Some 30 legions had been sufficient to vanquish barbarians in forest, desert, mountain or marsh. But the legions had increasingly become the makers of emperors. In the interlude of the tetrarchy, Constantine's father had been chosen by Diocletian for his ability. But Constantine himself had used the Gallic army to stake his own claim for power and he was wary of the legions. Having triumphed by force, Constantine was determined to close the door for any future usurpers. At the heart of Constantine's new structure for the army was a more mobile force of 100,000 troops, initially withdrawn from the frontier garrisons and divided into several smaller field armies. The comitatenses were stationed well within the provinces in a marked contrast to the armys deployment during the Principate, which was used primarily to protect the Empires frontiers. The old system had meant that if an enemy successfully penetrated the frontier zone, it took considerable time to redeploy forces to defeat the threat. Moreover, withdrawing forces from one area could weaken its defence leading to further problems. Importantly, the comitatenses were at the immediate disposal of the Emperor and had greater freedom of manoeuvre to counter hostile incursions or, from the experiences of the civil wars, to protect the Emperor from the internal threat of usurpers. With the new army came a new command structure, based upon personal loyalty to the Emperor. At its head were two 'field marshals' for infantry and cavalry (magister peditum and magister equitum, respectively), both of whom were under Constantine's watchful eye. Senators were removed entirely from military command. Increased mobility would seemingly place greater emphasis on cavalry, ...yet in the crucial battles that the legions fought against Goths and Huns it was the clash of foot soldiers - not cavalry - that decided the Empire's fate." The Greek historian Zosimus, in the early 6th century AD noted other consequences of Constantine's reforms: "[He] abolished security by removing the greater part of the soldiery from the frontiers to the cities that needed no auxiliary forces. He thus deprived of help the people who were harassed by the barbarians and burdened tranquil cities with the pest of the military, so that several straightway were deserted. Moreover, he softened the soldiers, who treated themselves to shows and luxuries. Indeed (to speak plainly) he personally planted the first seeds of our present devastated state of affairs.". The troops remaining on the frontiers (limitanei and ripenses - the 'border' and 'river' guards, respectively) were re-grouped into small units of 1,000 men, with limited cavalry support under the command of a dux. Contrary to the popular image, the limitanei were regular units of trained troops, who differed only in status from the comitatenses. The limitanei undertook the day-to-day patrolling and garrison duties on most frontiers, as well as some areas with internal disorder. The available evidence suggests these duties were performed well, yet some commentators have claimed the limitanei avoided any engagement with an enemy they were not expected to defeat. It is far more likely that their numbers were insufficient to single-handedly stop a major raid or incursion. Indeed, the limitanei were able to cope with small scale warfare and units were occasionally attached to, and operated effectively, with the larger field armies. In some cases the attachments became permanent with the units renamed pseudocomitatenses. Even though the overall army was larger than in the earlier Principate, Rome's effective combatant manpower was drastically reduced, was too expensive and was never mobile enough. The larger army required a vastly enlarged bureaucracy of rapacious tax-collectors and it had to levy the cities annually for manpower. The result was to send many cities into a downward spiral as the citizenry seeped away. Constantine responded to the crisis by introducing a law requiring sons of veterans to serve in the army. Military service, like tax collecting and other trades, became hereditary. Not only did the resulting lack of social mobility undermined esprit de corps in the army, but Constantine had laid one of the foundation stones of the later form of slavery we recognise as serfdom. So, with the demise of the old army structure, a common soldier could no longer be promoted through the ranks to eventually enter the imperial entourage and, if inclined, reach for the throne itself. 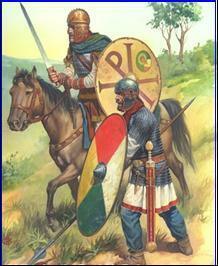 Constantine reforms had set the stage for 'lords' on horseback commanding poorly equipped conscripts. Divine, Dynastic Monarch! The wily Diocletian had begun a process (adapted from the Oriental theocracies) that Constantine refined and set as a model for all future monarchs - surrounding the imperial dignity with a halo of sacredness and ceremonial. A large court-retinue, elaborate court-ceremonials, and ostentatious court-costume made access to the Emperor almost impossible. When he eventually reached God's agent on Earth, a suppliant prostrated himself before the Emperor as if before a divinity (contrast this with Augustus, who had always stood to greet a senator!) Henceforth, emperors allowed themselves to be venerated as divine, and everything connected with them was no longer imperial but sacred. Constantine, not content with concentrating absolute (and divine) power into his own hands, went on to reduce the authority of provincial governors and generals (Duces and Comes). Some of this authority fell into the hands of the nouveau riche bishops, at whose head stood Constantine himself. Constantine hoped thus to prevent any rebellion arising in the provinces, but in so doing, he also weakened the ability of the provinces to resist invasion. The Birth of the State Church. Constantine had exploited Christianity to achieve power and now his desire for complete control saw him impose that same religion on the whole Empire. It was not as a fervent believer that Constantine was to patronize Christianity, but as means to firmly bond submission to the one God with loyalty to the one Emperor. In the century before the alliance of one particular faction with the imperium, many versions of Christianity had contended. Before Constantine, Christ had, for most Christians, been the good shepherd, just like Mithras and Apollo, not a celestial monarch or an imperial judge, and nor did the sects dwell on the crucifixion. But with Constantine's absolute monarchy, Christianity acquired its panoply of imperial triumphs. The leading bishop, Eusebius, hailed the Emperor as a new Moses, a new Abraham. Constantine appeared to see himself, more modestly, as the thirteenth apostle, a saint-in-waiting! At the time, perhaps 5% of the Empires population was nominally Christian. With imperial encouragement, support, funds and force the Church set about the task of gathering its flock. In a number of provinces, a serious breach had opened within the Christian churches between those who had renounced their faith (apostatised) during Diocletian's brief persecution and those who had suffered penalties for their beliefs. Some churches already had a nationalistic bent, serving as a focus for opposition to the Emperor. 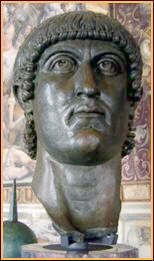 Constantine, vexed by all such discord, called for an inclusive universal or catholic faith. Of course, all factions regarded themselves as that universal orthodox faith and manoeuvred for preferment. It was inevitable that an autocrat like Constantine would identify with and adopt a church which modelled its organisation not merely upon the Roman State but upon its most authoritarian aspect: the Imperial Army. In the Constantinian church, bishops would preside over districts corresponding with military dioceses, would control appointments and impose discipline. Lesser clerics would report through a chain of command up to the local pontiff. Staff officers, in the guise of deacons and presbyters, would control funds and allocations. In fact, it was this very same paramilitary organisation that had aided the spread of Christianity (from virtual obscurity during the Pax Romana) and had first attracted Constantine to champion the Christian cause in his bid for the throne. Spoils of Victory: Pillaging the Pagans. It is not unfair to say that the early Church at this period was highly intolerant of any competition. This is hardly surprising as, throughout recorded history, new religions have always struggled, zealously, to establish themselves as the true faith, radical and different from all previous versions. The Universal Church had eyed with envy the pagan temples and shrines which, through centuries, had amassed fortunes. In favouring Christianity, Constantine sanctioned intolerant zealots to make a concerted effort to crush all opposition. As his propagandists, influential Christian leaders had the ear of Constantine and successfully urged him to confiscate temple treasures throughout the Empire, much of it redirected to the One True Faith. The assault upon the values that had sustained the Empire for a thousand years was merciless and relentless. It began with Constantine's denial of state funds to the ancient pagan shrines, which had always depended on state sponsorship. Never having had full-time fund raisers like the Christian churches, the pagan cults immediately went into decline. Yet having given the Christians the world, Constantine had failed to anticipate the ferocity of Christian discord, which was to dog his reign and the reign of his successors. The Christian community itself had changed as a consequence of the Constantinian revolution. Official recognition of Christianity, the tax exemptions it gave devotees and state patronage made the Christian faith considerably more appealing to opportunistic pagans. Episcopal posts became highly sought after when, in 319 AD, the clergy were exempted from public obligations and, in 321 AD, priests were exempted from imperial and local taxation. Clerics were even placed outside the jurisdiction of normal courts. Consequently, a flood of new converts, many with little or no religious motivation, swamped the Church. Fierce rivalries within it multiplied, weakened its power and exposed vulnerabilities in both its doctrine and organisation. Post-Constantine: Lurch into Religious Tyranny. Constantine had successfully established the dynastic principle, but it had become a bitter fruit. His feeble sons, born to rule, murdered each other in an all-consuming power struggle (the survivor died falling from his horse). Worse yet, Constantines nephew, Julian, though raised as a Christian, detested the doctrine and, on assuming the throne, reversed many of Constantines policies. To the alarm of the new Christian establishment, the pagan world seemingly not die quietly. Fortunately, within three years, the Emperor Julian had been assassinated on the Persian front and with the prize once again unexpectedly within their grasp, the Christian Church was fearful of losing it. Thereafter, the Church embraced a ruthlessness hitherto unknown in the world that, in the centuries ahead, would wreak unimaginable horror. In the closing years of the 4th century AD, draconian laws prohibiting non-Christian beliefs were enacted by the new (Christian) Emperor Theodosius. Heresy became equated with treason and was thus a capital offence. Theodosius the Great presided over the destruction of temples and icons, the burning of books and libraries, and a murderous rampage of pagan priests, scholars and philosophers. The prologue to the Dark Age in Europe had been written through the sacrifice of the wisdom and finesse of an entire civilisation on the altar of new belief. 1. 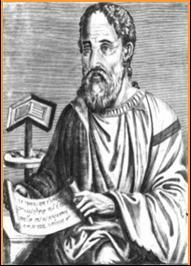 Eutropius 10.8; Jerome, Chronicon s.a. 337; and Socrates 1.39.1. 3. Lenski, "Reign", 59. Barnes opts for a date "soon after...270", preferring 272 or 273 (Constantine and Eusebius, 3). Elliott, too, chooses 272 or 273 (Christianity, 17). Odahl suggests 273 (Odahl, 16). Dates in the 280s have been recently refuted (Pohlsander, Constantine, 14). 4. Timothy D. Barnes, The New Empire of Diocletian and Constantine Cambridge, MA: Harvard University Press (1982), 3942; T. G. Elliott, "Constantine's Conversion: Do We Really Need It?" Phoenix 41 (Winter 1987), 4256; T. G. Elliott, "Eusebian Frauds in the "Vita Constantini"". Phoenix 45 (Summer 1991), 163; Elliott, Christianity, 17; Barbara Saylor Rodgers, "The Metamorphosis of Constantine". The Classical Quarterly 39 (1989), 238; David H. Wright, "The True Face of Constantine the Great". Dumbarton Oaks Papers 41 (1987), 495, 507. 5. A.H.M. Jones, Constantine and the Conversion of Europe. London: The English Universities Press (1948), 12. 6. Barnes, Constantine and Eusebius, 3; Lenski, "Reign", 5960; Odahl, 1617. 7. Ancient sources: Ambrose De Obit. Theod. 42; Jerome, Chronicon 306; Origo Constantini 2. Modern commentary: Barnes, 3; Lenski, "Reign", 59. 9. Simon Corcoran, "Before Constantine". The Cambridge Companion to the Age of Constantine. Ed. Noel Lenski. New York: Cambridge University Press (2006), 4154; Odahl, 4650; Warren Treadgold, A History of Byzantine State and Society. Stanford: Stanford University Press (1997), 1415. 10. Barnes, Constantine and Eusebius, 3; Lenski, "Reign", 5960; Odahl, 47, 299; Pohlsander, Constantine, 14. The date of Constantius' remarriage is a contentious issue. Pohlsander and Odahl favor a remarriage in 293, as the Origo Constantini links the two events explicitly, while Barnes and Lenski favor a 288 or 289 date, based on a reading of the Panegyrici Latini dated 21 April 289 that seems to suggest that Constantius was already married to Theodora at the time. 11. Corcoran, 401; Barnes, Constantine and Eusebius, 3, 8; Odahl, 467; Pohlsander, Constantine, 89, 14; Treadgold, 17. 12. Lenski, "Reign", 60; Odahl, 7273. 13. Eusebius, Vita Constantini 1.19; Odahl, 7273. 14. Barnes, Constantine and Eusebius, 2225; Odahl, 6769. 15. H. A. Drake, "Lambs into Lions: Explaining Early Christian Intolerance". Past and Present 153 (November 1996), 15, 345; Treadgold, 25. 16. H. A. Drake, "The Impact of Constantine on Christianity". The Cambridge Companion to the Age of Constantine. Ed. Noel Lenski. New York: Cambridge University Press (2006), 126. 19. H. A. Drake, "Impact", 126. 21. Barnes, Constantine and Eusebius, 2527; Odahl, 6972. 22. Lenski, "Reign", 6061; Odahl, 7274; Pohlsander, Constantine, 15. 24. Barnes, Constantine and Eusebius, 27; Lenski, "Reign", 61; Odahl, 77. 25. Barnes, Constantine and Eusebius, 2728; Lenski, "Reign", 6162; Odahl, 7879. 26. Barnes, Constantine and Eusebius, 2829; Lenski, "Reign", 62; Odahl, 7980. 27. Barnes, Constantine and Eusebius, 29. 28. Odahl, 80; Pohlsander, Constantine, 1415; Treadgold, 28. 29. S. Angus, The Mystery Religions, p.236. 30. Lactantius, On the Death of the Persecutors, chapter XLIV; ANF. vii, 318. 31. Eusebius, Vita Constantini (1.xxvi-xxxi). 32. Ferrill, A. (1986), The Fall of the Roman Empire: The Military Explanation, Thames & Hudson. 33. Zosimus, Historia Nova, II.34. 34. Goldsworthy, A. (2003), The Complete Roman Army, Thames & Hudson, 203. Most historians assert 272 AD as Constantines birth year following a number of ancient sources, but another equally reliable contemporary source suggests a birthdate of 276 AD, and modern historians have argued for dates as late as 288 AD. In later years, Constantine would often lie about his age for political gain, further confusing the issue. In any case, Constantine was born in an age in which births were not regularly registered; it is likely that Constantine himself did not know exactly when he was born. 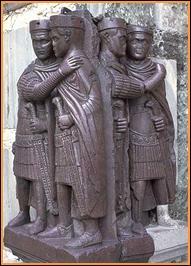 Image: The Tetrarchy of Diocletian and Maximian, with Constantius and Maximinus. Constantines silence on his complicity in Diocletians Great Persecution is strangely at odds with his later championing of the Christian cause. Perhaps the latter was more political expediency than conversion to the faith. 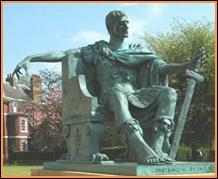 Image: Bronze statue of Constantine in York sited near the spot where he was proclaimed Augustus in 306 AD. 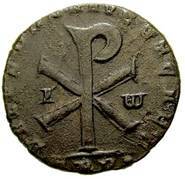 Image: The Chi-Rho symbol was frequently depicted on the reverse of coins after Constantine�s accession. Constantine directed that a spear be covered in gold, with a crosspiece representing a cross, and that the image of the chi-rho be placed above the crosspiece encircled by a crown or wreath. A banner was hung from the crosspiece of imperial (Tyrian) purple and gold cloth. By tradition, Constantine had this Labarum carried before his legions, protected by colour guard of 50 selected men called the Praepositi Laberorum. Constantine's official imperial title was IMPERATOR CAESAR FLAVIVS CONSTANTINVS PIVS FELIX INVICTVS AVGVSTVS (Imperator Caesar Flavius Constantine Augustus, the pious, the fortunate, the undefeated). After 312 AD, he added MAXIMVS ("the greatest"), and after 325 AD replaced ("undefeated") with VICTOR, as invictus a reminder of Sol Invictus, the Sun God. 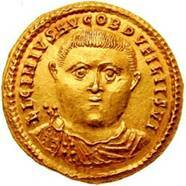 Image: Aureus of Licinius celebrating the tenth year of his reign. The mobility of the Comitatenses of the 4th century AD should not be exaggerated. Any one field army could only move as fast as its marching infantry or the accompanying baggage train. The Notitia Dignitatum, which lists imperial posts and military commands at the very end of the 4th century, records five field armies in the Eastern Empire, two associated with the imperial court, while the Western Empire had seven, three of which were comparatively small. 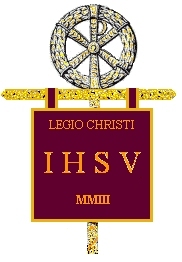 Image: Legionary of the Emperors mobile field army, the Comitatenses. Image: Emperor Marcus Aurelius� twice life-size statue, originally gilded to look like solid gold, is a prized exhibit of the Capitol Museum, Rome. It apparently survived papal melting pots because ignorant clergy thought it had to be their hero Constantine! Privilegia Ecclesiastica: The revolution of Constantine transformed the Church beyond recognition. Bishops and priests, no longer elected or acclaimed by the brethren but members of a self-perpetuating order, enjoyed exemption from taxation and all other public service. As state officials they received generous stipends; and as a custodians of the Church, bequests from those who died. While they might not 'own' church property, theirs was undeniably a privileged and exclusive use of ever-grander riches and properties during their own earthly presence. But in 321 AD, Constantine went further and began the process by which the clergy were exempted from the jurisdiction of civil law and the decisions of bishops became binding on civil magistrates.